The Brazil international only joined the Blaugrana from Liverpool for a club-record £142m fee last winter but he has struggled to cement a regular role. According to Mundo Deportivo, United have already made tentative enquiries for the former Liverpool man and they are seeking a possible transfer within the ongoing transfer window. Still, the Brazilian won't come on the cheap for United, given Barcelona are said to want nearly the £142m sum paid to the Reds for his signature 12 months ago. 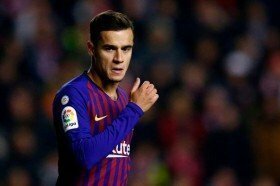 Coutinho has been a regular substitute for the Spanish champions of late with manager Ernesto Valverde preferring Ousmane Dembele to partner regulars Luis Suarez and Lionel Messi in a three-man frontline. Manchester United are currently six points behind Chelsea for the final Champions League spot and they have the opportunity to either maintain or close the gap when they face Tottenham Hotspur on Sunday.